If you build a user interface for a script, you can publish the script as a web app. For example, a script that lets users schedule appointments with members of a support team would best be presented as a web app so that users can access it directly from their browsers. Both standalone scripts and scripts bound to G Suite applications can be turned into web apps, so long as they meet the requirements below. It contains a doGet(e) or doPost(e) function. The function returns an HTML service HtmlOutput object or a Content service TextOutput object. An object of key/value pairs that correspond to the request parameters. Only the first value is returned for parameters that have multiple values. e.contextPath Not used, always the empty string. Using these parameters may result in an HTTP 405 response with the error message "Sorry, the file you have requested does not exist." If possible, update your script to use different parameter names. Save a new version of the script by selecting File > Manage Versions, then Save New Version. 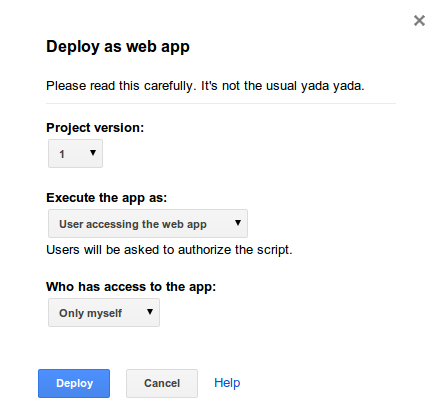 Select Publish > Deploy as web app. Under Project version, select the version you just saved. Under Execute the app as, select whose authorization the app should run with: your account (the developer's) or the account of the user who visits the app (see permissions). Under Who has access to the app, select who should be allowed to visit it. The options differ depending on the type of account you have, but they can include "Only myself", any member of your domain, "Anyone" (with a Google account), or "Anyone, even anonymous". Once you click Deploy, you'll see a new dialog with a message indicating that your project has been successfully deployed as a web app. The first is labeled Current web app URL and ends in /exec. This URL is for the published version of your app, based on the last version you saved and deployed. The second is the link labeled latest code and ends in /dev. This URL can only be accessed by users who have edit access to the script. This instance of the app always runs the most recently saved code — not necessarily a formal version — and is intended for quick testing during development. You can share the web app URL with those you would like to use your app, provided you have granted them access. It is also possible to distribute web apps in the Chrome Web Store for public use. Warning: When deploying web apps to run as the developer, you should exercise great care when handling OAuth tokens obtained through ScriptApp.getOAuthToken(). These tokens can grant other applications access to your data — never transmit them to the client. Note: Web apps deployed in one domain cease to function if their ownership changes to a Team Drive or account in a different domain. This can be corrected by having the new owner or collaborator redeploy the web app in the new domain. Alternatively, if the web app is moved back to its original domain the web app will start functioning again for that domain without redeploying. Execute the app as me—In this case, the script always executes as you, the owner of the script, no matter who accesses the web app. Execute the app as user accessing the web app—In this case, the script runs under the identity of the active user using the web app. This permission approach causes the web app to show the email of the script owner when the user authorizes access. Warning: To prevent abuse, Apps Script imposes limits on the rate at which new users can authorize a web app that executes as the user. These limits depend, among other factors, on whether the publishing account is part of a G Suite domain. Note: You can collaborate on web apps using Team Drives. When a web app in a Team Drive is deployed, choosing to "execute as you" causes the web app to execute under the authority of the user that deployed it (since there is no script owner). 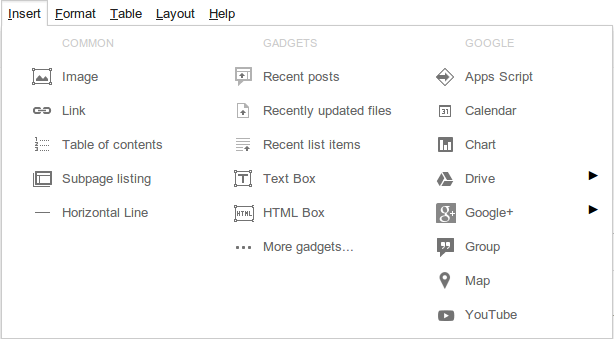 You can also embed web apps in both the classic and new versions of Google Sites. Warning: Embedded web apps are still subject to access permissions to prevent malicious use. If your embedded web app doesn't seem to be working, check to see if the permissions set by the web app owner and the domain administrator allow its use. In order to embed a web app, it must first be deployed. 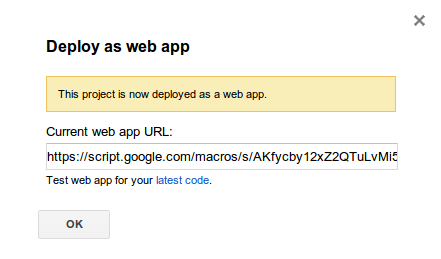 You also need the Current web app URL from the Deploy as web app dialog. Open the Sites page where you'd like to add the web app. Select Insert > Embed URL. Paste in the web app URL and then click ADD. The web app appears in a frame in the page's preview. When you publish the page, your site viewers may need to authorize the web app before it executes normally. Unauthorized web apps present authorization prompts to the user. You can bind a script to a classic Google Site in much the same way as a you can bind a script to a Google Doc or Sheet. To create a bound script, visit your site, click the gear icon , then select Manage site. On the Manage Site page, click Apps Scripts in the left nav, then the Add new script button. This opens a new script in the Apps Script editor, where you can code and deploy your web app. Open an existing Site for which you have edit access or create a new Site. Navigate to the page in your Site where you want to embed the web app. Click the edit icon, and then Insert > Google Apps Script. Choose the script from the list that represents your web app. If your web app is not bound to this Site, you can paste in the web app URL instead. Click the Select button, choose the desired options from the next dialog, and click Save. Save your changes to the page and then you should see your web app embedded in your Sites page. It can be desirable to have an Apps Script web app simulate a multi-page application, or one with a dynamic UI controlled via URL parameters. In order to do this well, you can define a state object to represent the app's UI or page, and push the state into the browser history as the user navigates your app. You can also listen to history events so that your web app displays the correct UI when the user navigates back and forth with the browser buttons. By querying the URL parameters at load time, you can have your app dynamically build its UI based on those parameters, allowing the user to start the app in a particular state. google.script.history provides methods to allow dynamic response to browser history changes. This includes: pushing states (simple Objects you can define) onto the browser history, replacing the top state in the history stack, and setting a listener callback function to respond to history changes. google.script.url provides the means to retrieve the current page's URL parameters and URL fragment, if they are present. These history APIs are only available to web apps. They are not supported for sidebars, dialogs or add-ons. This functionality is also not recommended for use in web apps embedded in a Google Sites.